Rates may vary by season and ticket category and are subject to change without notice. 8:30 a.m. – 5:30 p.m. until May 17, 2018. Open daily except Thanksgiving, Christmas, New Year’s Day. 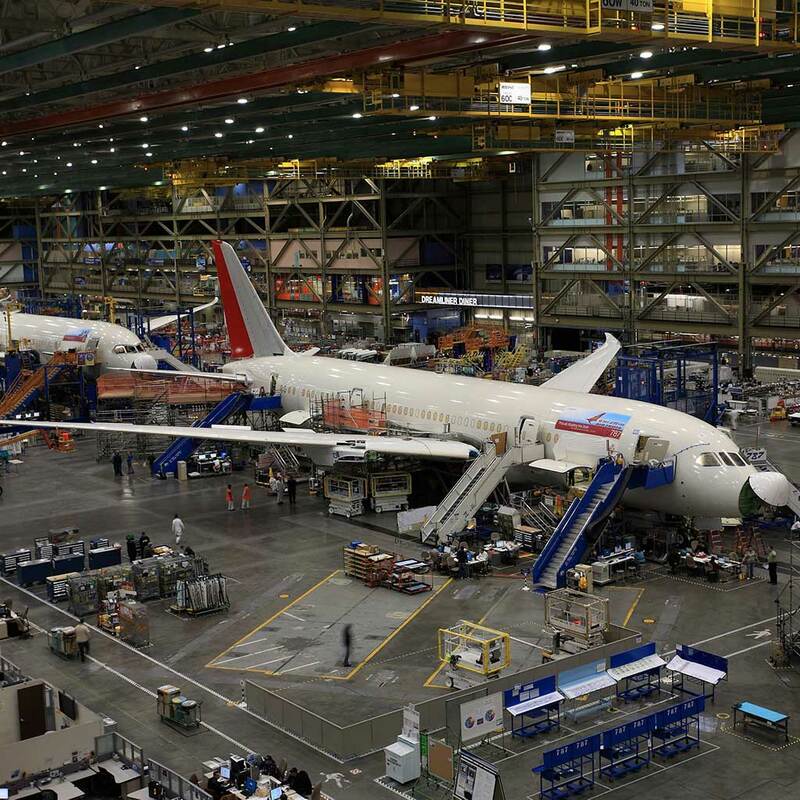 s.
Located just north of Seattle, the Future of Flight Aviation Center & Boeing Tour is a one-of-a-kind opportunity to view 747, 767, 777, and 787 Dreamliners being assembled on the Everett production line before they take to the sky. Each factory tour is 90-minutes long and includes a short video including fascinating facts about Boeing and the planes that bear its name. After riding a tour coach and visiting the assembly plant -- the world’s largest building by volume -- you can explore the Future of Flight Aerospace Gallery, where a mockup of the International Space Station module Destiny is on display. * You can also touch and compare fuselage sections of the 787 Dreamliner and a Boeing 707, sit in a 727 cockpit, digitally design your own jet, and explore interactive displays and hands-on exhibits. In addition, there are two gift shops, a café plus the top-rated Strato Deck observation area with dramatic views of the Boeing flight line, Dreamlifter Operations Center, Olympic and Cascade Mountain ranges. Parking is free. History: The Boeing Company announced in 1966 that it would build the 747, the world’s largest jetliner. This would require the company to construct an equally impressive manufacturing complex, recognized by the Guinness Book of World Records as the largest building in the world, by volume. 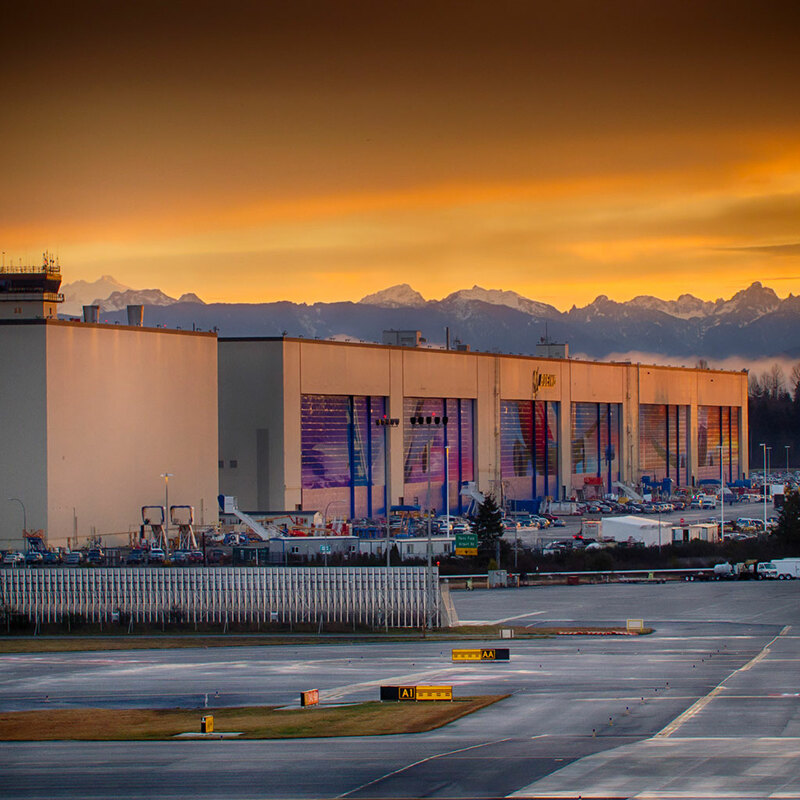 The building has grown over the years to enclose 472 million cubic feet of space (13.3 million cubic meters) and houses assembly for Boeing twin-aisle airliners. On the south side of the mammoth factory, the largest murals in the world are on display. Boeing began officially conducting Everett factory tours in 1968, the year the 747 rolled out to meet the world. 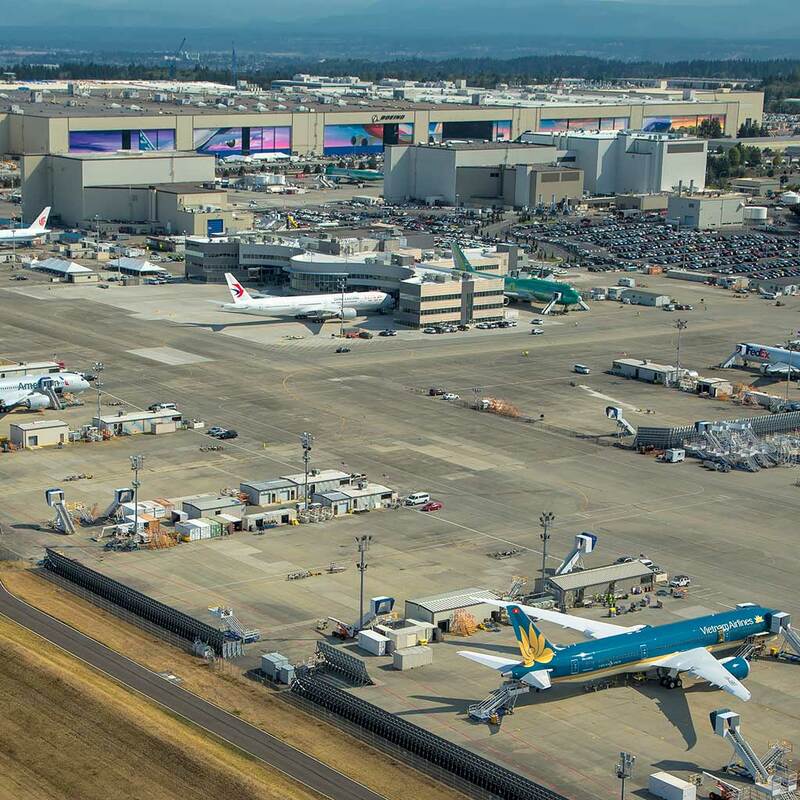 In 2007, the three-millionth visitor was welcomed and in 2017 the Boeing Company celebrated 50 years at Paine Field. 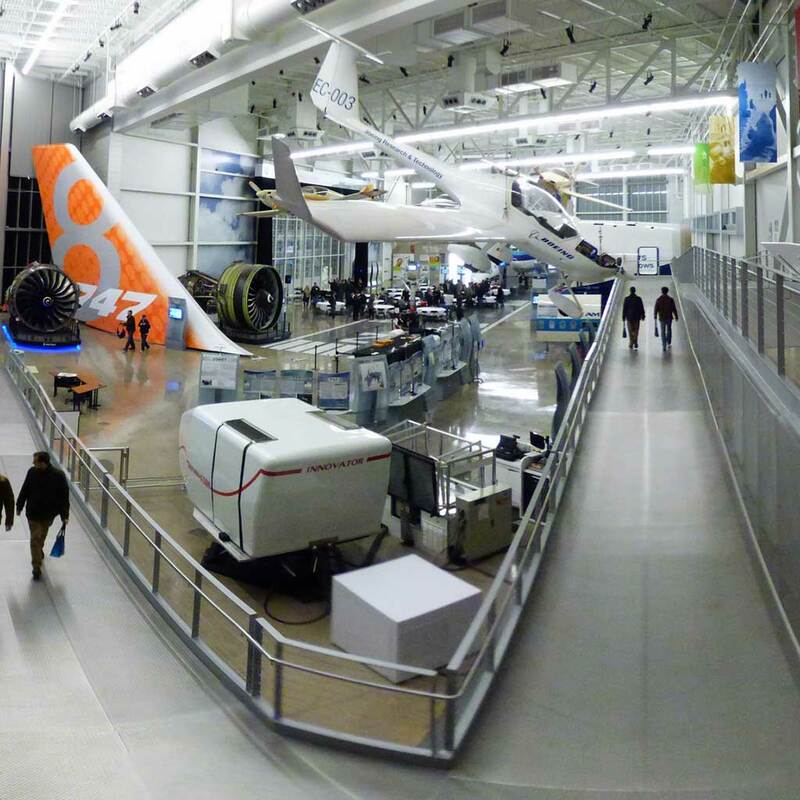 The county-owned Future of Flight Aviation Center opened in 2005, replacing the old Boeing tour center that dated from the 1980s. 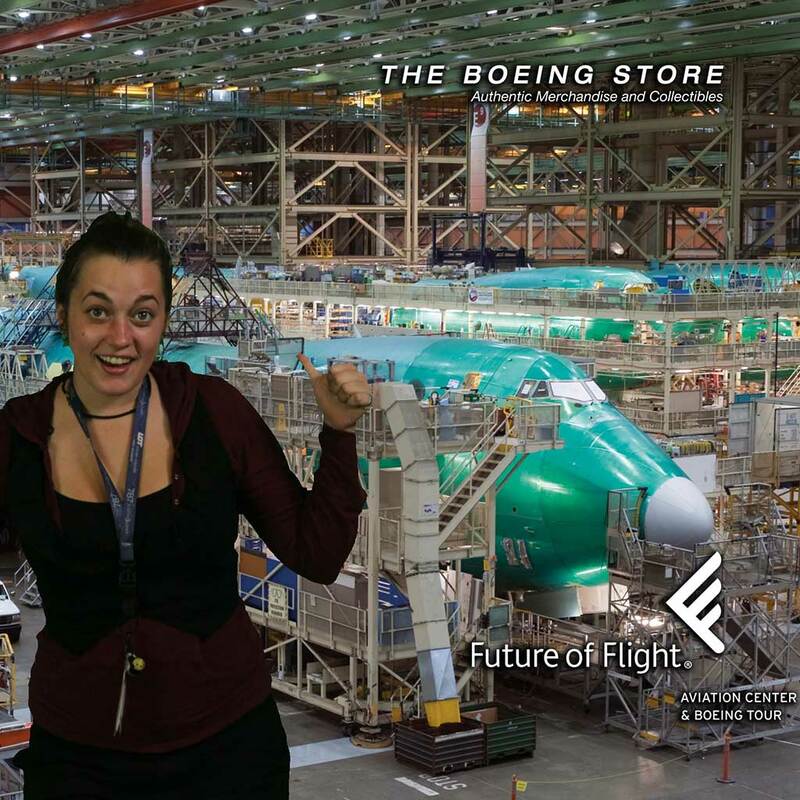 In the last year alone, the Future of Flight Aviation Center & Boeing Tour welcomed more than 400,000 visitors from 185 countries making it the most popular attraction in North Puget Sound. During the summer months, more than half of all visitors arrive from foreign countries. With commercial air service set to commence from Paine Field in the fall of 2018, this is likely to increase. Please note: Children must be at least 4 feet tall (122 cm) to take the Boeing Tour. All tours are conducted in English and cameras, cell phones, and other electronic devices are allowed only in the Aerospace Gallery and Strato Deck of the Future of Flight Center and may not be taken to the factory. Free lockers are available in the lobby. The Boeing Tour involves walking up and down two steep flights of stairs plus through two large tunnels totaling .3 miles (.5 km) roundtrip. Then, visitors ride freight elevators to view balconies overlooking the factory floor and assembly lines. With advanced notice, special accommodations can be arranged for those in wheelchairs or who are otherwise physically challenged.